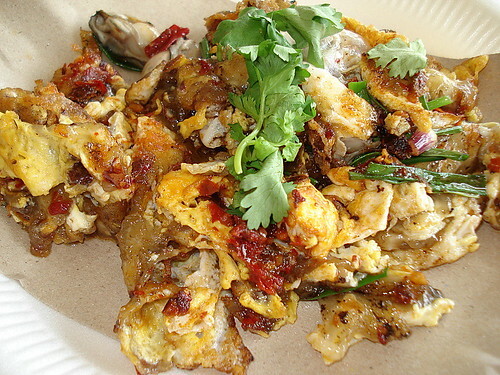 Oyster omelette or or luak is one of my most favourite sinful foods. This looked good on other people's tables, and I hadn't had any in a long time, so I got me some too. Just a tiny portion (S$3) since this is such a grease bomb. There's no way this plump juicy oyster can escape..., originally uploaded by Camemberu. I know this sounds unusual but I actually like the gooey (is it sweet potato?) starch bits, which are especially nice when tainted by oyster juices (they absorb that exotic musky sea flavour so well). Here, they use fairly fresh, plump and juicy oysters but I only dared eat one or two (still haven't got my Hepatitis shots!). The strange thing was the sambal - made from pounded dried chili and some bean paste. It tasted slightly unusual and I can't quite decide if I like it. The sourish chili dip tasted a little watery on its own but held up fine when taken together with the oyster omelette. Overall, this is still not the best I've had but it's fairly decent. This truly is extremely greasy and is still sitting in my tummy, refusing to move along. 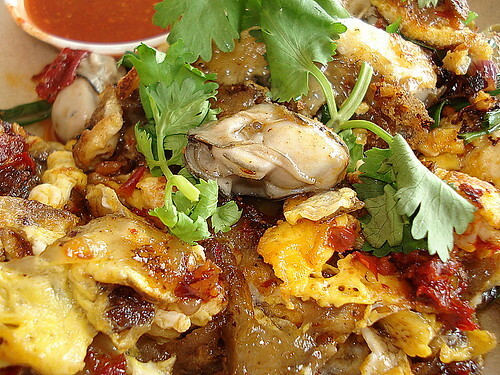 Don't think I can eat oyster omelette again for quite a while. 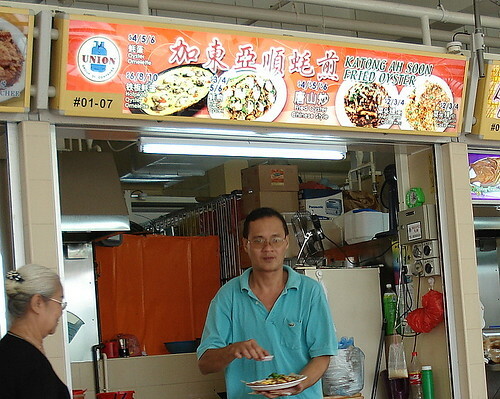 Katong Ah Soon Fried Oyster, originally uploaded by Camemberu. They do oyster omelette in a variety of ways here - on hotplate, Chinese style (whatever that means) and just plain fried oyster. Carrot cake also available.